This is a time of wonders and miracles, but it doesn’t always seem that way. If you think you know what miracles look like, or what they need to look like, you will miss one miracle after another. You won’t even see the trees, so to speak, much less the forests. Our social structures are dissolving and that is part of the miracle of the birth of a new human species, just as a flower blooming in the spring is a miracle, or a bird singing. You are part of the miracle, too. Miracles in miracles in miracles never ending is a vision that most of us forget in our everyday immersion in the miracles of our lives. Some of them are pleasant to experience and some are painful. Some are ecstatic and some are excruciating. When we think that miracles cannot be painful, we turn our backs on the wisdom and compassion behind the experiences of our lives, and we cannot see how perfect each is for us, given the choices that we have made. The new human species is not necessarily more wise and compassionate than the species it is replacing. It is more aware. It sees the consequences of fear and the consequences of love and each human experience as an opportunity to choose love. It also sees that fear now creates only violence and destruction. The choices we make are intimate and personal. The consequences they create go far beyond what we can see or imagine, and they are real. The new human species is becoming aware of that, and that is why so many of us are now striving to become aware of the choices we make and the consequences they create. 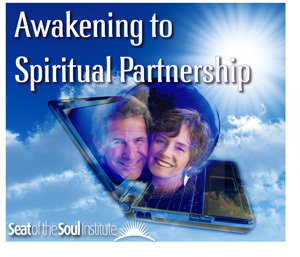 The Seat of the Soul Institute will always support you with tools to choose consciously, create with love, and give the gifts you were born to give. The Occupy movement continues to spread around the world despite beatings, arrests, evictions, and the loss of so much personal property, frequently by people who have little personal property. The energy in general, as far as I can see, is not defiant in a superior way or angry in a personal way. 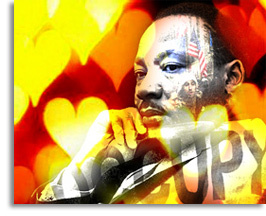 As Martin Luther King, Jr., said in his famous I’ve-Been-to-the-Mountain-Top speech the night before he died, “There are some kinds of fire that water can’t put out.” He was on fire and so was the civil rights movement in the United States – with courage, clarity, and commitment unto death. Now another fire is burning. Its intent is not to consume Wall Street, but to occupy it, to make it our own, to become one with it in order to change it for the better. There is no other way to change something for the better except to occupy it first. The only person you can occupy is yourself. That is why the only person who can change you for the better is you. Without your decision to change and your commitment to change, you will not change. Religions cannot change you. If you are angry, you will become an angry Muslim or an angry Hindu. If you are righteous, you will become a righteous Christian or a righteous Jew. No dynamic other than your own ability to distinguish within yourself between love and fear and choose love can change you, moment by moment, decision by decision. In other words, the only things standing between you and the compassionate, wise, and joyful person you want to be are matters of choice. Your choice. No one can occupy your generosity except you. Who can occupy your patience when impatience roars through you? Who except you can choose not to act with judgment when all of your thoughts are judgmental? Your life is yours to live, no matter how you choose to live it. When you do not think about how you live it, it lives you. When you occupy it, step into it consciously, you live it. At its best the Occupy movement expresses this, draws from it, and creates with it. It is a movement of self-responsibility uniting countless self-responsible participants – an impossibility for the mind to grasp but not for the heart. Commitment and creativity cannot be captured and handcuffed. Inspiration cannot be jailed. The heart cannot be contained. Who can occupy your heart except you? What will happen when you do? GARY AND OPRAH TOGETHER AGAIN - ON RADIO ! In 2007 Oprah invited Gary to inaugurate a satellite radio concept called Oprah's Soul Series. Five years later, Oprah’s Soul Series is still going strong! 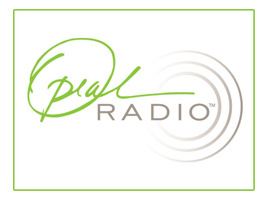 Now get ready for two new and profound radio interviews on Oprah's Soul Series., XM Radio 111 Sirius 204. 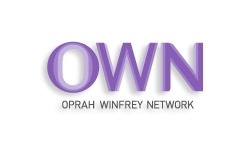 In 2010 Oprah premiered a revolutionary new format on OWN – Super Soul Sunday. Join Gary and Oprah February 12 on Super Soul Sunday for their first appearance on TV together in more than a year. Tune into OWN for Super Soul Sunday. Click this Station Finder for your local channel and time. Two things became very clear. That I was more than I thought I was and that I could embrace my spirituality without the dogma of religion. Many years before I had let go of the religion I was exposed to when I was growing up. I realized it didn’t have the ability to explain to me what was important and excluded too many people on our planet. Because I thought that religion and spiritually were same, I also pushed anything to do with spirituality away. At the time I first read the book, I begin to see that the situations I had experienced in my life were opportunities for me to grow spiritually, e.g., I realized that I had been supported to leave my painful marriage through the clear visions and knowing that had come from non-physical guidance. In fact, I saw that I had always been guided when I was open enough to notice. Before reading the book, I had always prided myself on my intuitive ability, but those thoughts came from parts of me that felt I was superior to others and not from loving parts of me. Just recently I have had deeper insights to what actually happened when I read The Seat of the Soul the first time. I realized I was being opened to the very thing that Gary wrote about in The Seat of the Soul. I was changing into a multisensory human as I read about this new ability. I had read that within the next few human generations becoming multisensory would become a part of everyone’s consciousness on the Earth for the first time in our evolution, but at that time I didn’t realize that it was actually becoming part of me immediately as I read. For example, very soon after I read Gary’s book I was on a team of nurses taking care of a three-and-a-half-month-old baby who was born with no ability to interact. 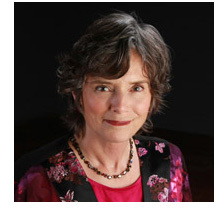 I wrote about her in the August 2011 Soul Connections. She had no sight, hearing or reaction to touch. She was not able to eat without a feeding tube in her tummy. She was totally non-responsive to her environment, and her birth was considered a tragedy by her parents and many who heard about her or took care of her. I would have felt that way also, however, the awareness of multisensory perception in me changed the way I viewed everything. I knew that her birth was neither an accident nor a tragedy. I knew she had come into the lives of these people, including me, for a purpose whether I knew what that was or not. So much is visible to me now that I have allowed myself to continue looking at my life from a multisensory perspective, and this has opened my heart in so many unexpected and powerful ways. "The power of the heart is the power of Life."